New North Carolina State University research delves into the movement and evolution of the pathogen that caused the Irish potato famine in the 1840s, which set down roots in the United States before attacking Europe. To track the evolution of differing strains of Phytophthora infestans, the pathogen responsible for the Irish potato famine and a major cause of late-blight disease on potato and tomato plants around the world, NC State plant pathologists studied 12 key regions on the genomes of 183 pathogen samples - historic and modern - from across the globe. The study, published in PLOS ONE, shows that a lineage called FAM-1 caused outbreaks of potato late blight in the United States in 1843 and then two years later in Great Britain and Ireland. It was also found in historic samples from Colombia suggesting a South American origin. FAM-1 caused massive and debilitating late-blight disease outbreaks in Europe, leaving starvation and migration in its wake. Jean Ristaino, William Neal Reynolds Distinguished Professor of Plant Pathology and the corresponding author of the study, theorizes that the pathogen arrived in Europe via infected potatoes on South American ships or directly from infected potatoes from the United States. But FAM-1 wasn't just a one-hit wonder that made its mark and then quickly disappeared. "FAM-1 was widespread and dominant in the United States in the mid-to-late 19th century and the early 20th century," Ristaino said. "It also was found in Costa Rica and Columbia in the early 20th century." "FAM-1 survived for about 100 years in the United States but was then displaced by a different strain of the pathogen called US-1. US-1 is not a direct descendant of FAM-1, but rather a sister lineage." US-1, in turn, has been elbowed out of its eponymous homeland by even more aggressive strains of the pathogen that have originated in Mexico. Our winter vegetable crops, grown there and imported into the U.S., harbor the pathogen, she said. The pathogen's effects aren't limited to the decimation of Ireland's potato crop 170 years ago. Billions are spent worldwide each year in attempts to control the pathogen, Ristaino said. 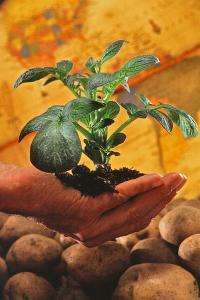 Potatoes in the developing world are particularly vulnerable as fungicides are less available and expensive.